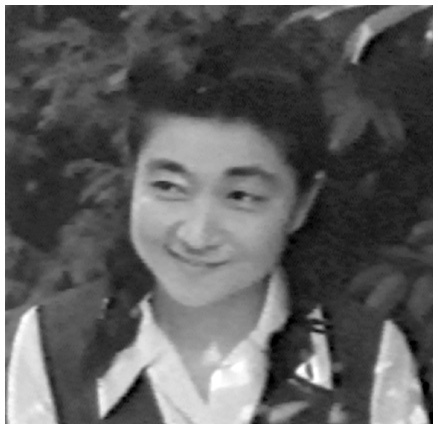 I am writing to you as a daughter of a long time farmer, Kenneth Kamiya. 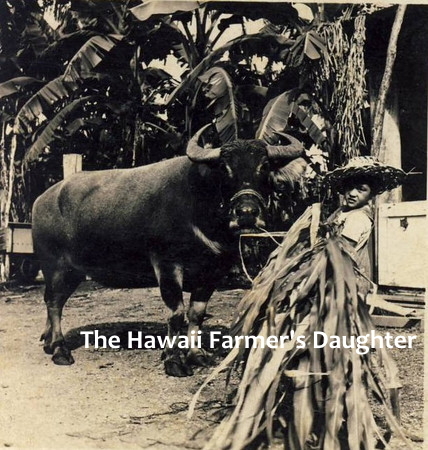 Our family has been long time farmers for over 4 decades on the Windward side on Oahu. 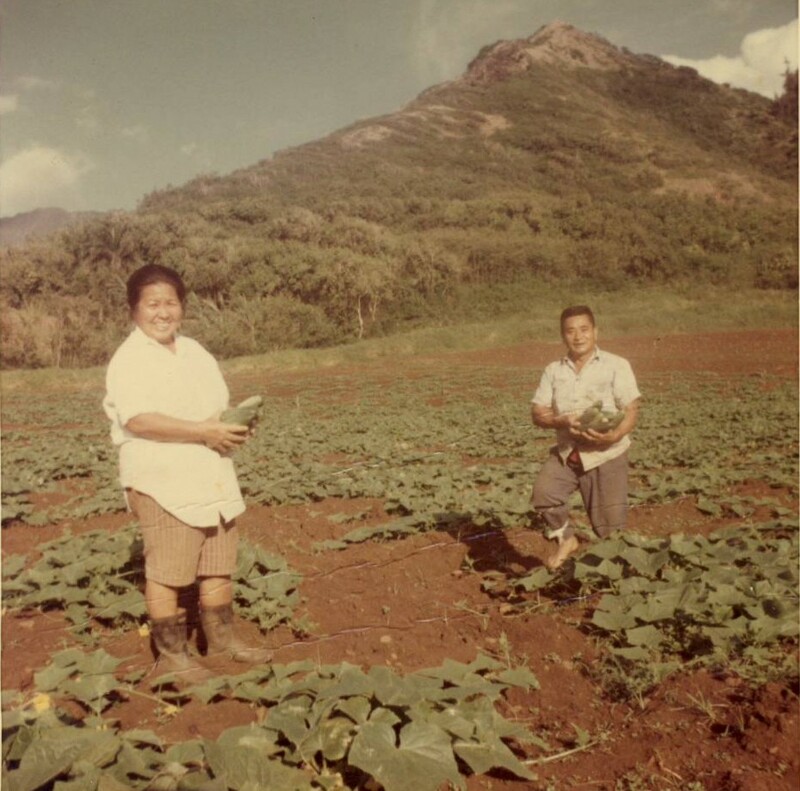 My grandfather farmed the land with beans, Okinawan potatoes, cucumbers and finally papaya, which my dad and brother continue to this day. 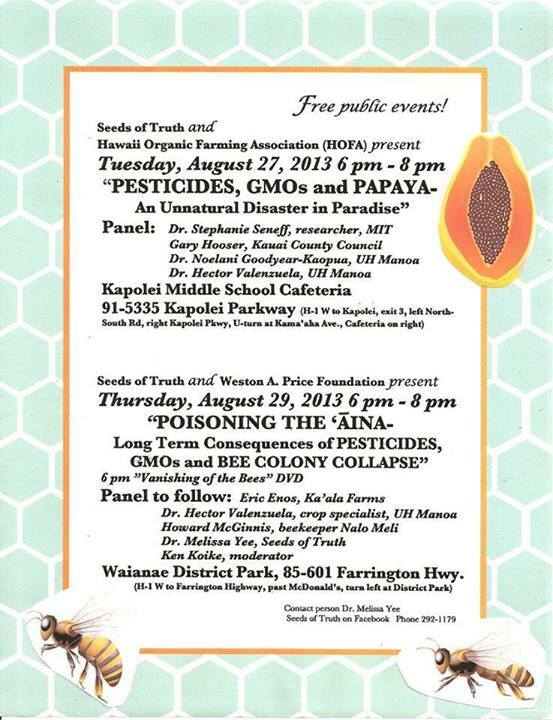 I am asking for your support in these contentious times of dealing with the issue of agricultural technology, specifically GMOs. I speak out not only for our family but for all other families in our islands who use this technology to run the farms that they do. Our state cannot afford to be left behind because of the maligned fears of the public of this technology. You as a leader also have to be able to separate fears created by the black marketing strategies and consider the evidence that is presented. That is your responsibility to us as your constituents, even though the farmers and ranchers make up 1-2% of the public. Those are the voices that should ring loud and clear in your minds. Notice how much hate there is because fear has made many people irrational already. Ignorance is evident here in many of these comments. And it’s not pretty to be at the receiving end of it. 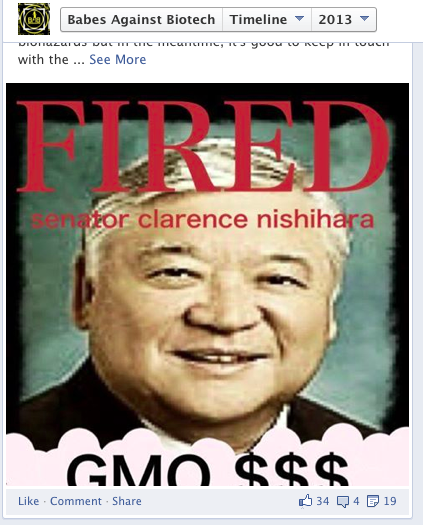 We know that many of you have become the receiving end of these activists, especially the Babes Against Biotech who went after Senator Nishihara last year. We know that many of you have also been portrayed as targets too. So when leaders like you decide to reject the evidence presented, you are feeding and fueling fear. 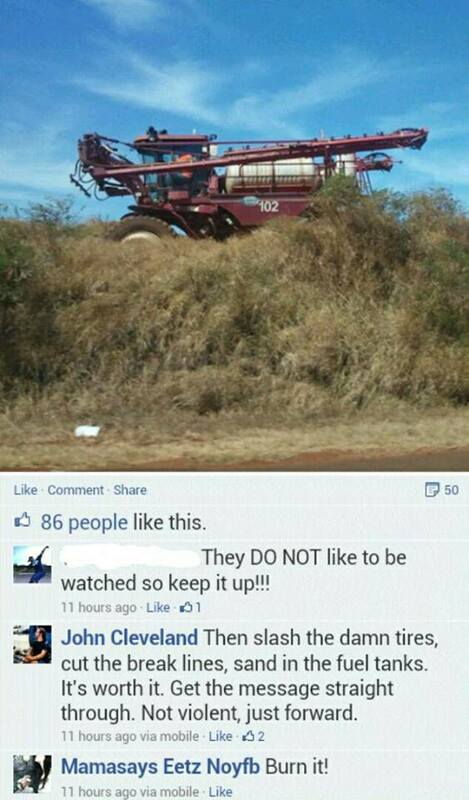 This same fear happens because so many people have little to no knowledge about agriculture or the technology around it. They may be loud and demanding but you must also listen to the quiet ones who toil in the fields every day. My family like so many others are just regular people who want to have access to the tools to do the job we have at hand, which is to feed people the best way possible. When it comes time to listening to your constituents, all I ask is that you listen to your most valuable ones. The farmers! What can a Farmer do? Growing up as a kid and having to work on the farm, it is easy to not appreciate the things you have until you’re older. As a kid, I hated having to wake up early on the weekends to go down to the farm. We never had the chance to lounge around watch cartoons in the mornings. I used to think that this was so unfair that we were the only kids who couldn’t do this. It was like drudgery every weekend to know that we were the workers. From the time I was about 8 until I was well into my twenties, it was working on the farm at least once a week. Even during the summers it was working for me and my siblings. The work got easier when we realized that we could negotiate being paid. My parents always taught us that if we ever wanted something, we had to earn it fair and square. You couldn’t make deals with them if you wanted that new cassette tape of Wham! or Madonna. If you wanted it, you had to work. There was no other option to them. We did learn that grandma and grandpa were great ways to just get things easer though. Well, you can bet that as a teenager, when I had the first opportunity to get a job elsewhere, they were all for it. It felt great to not be working in the fields, or in the shed processing papayas for hours. To scoop ice cream in an air conditioned mall and decorate cakes was fun! The work was way easier than the farm any day. I was happy to be free as teen and later as a college kid. As I step back, my views of the farm have changed now that I have children. I realize that as much as I hated working on the farm, I truly had the best childhood growing up and an amazing farmer father. He was a tough guy as a dad and very strict but the lessons I learned stick with me to this day. 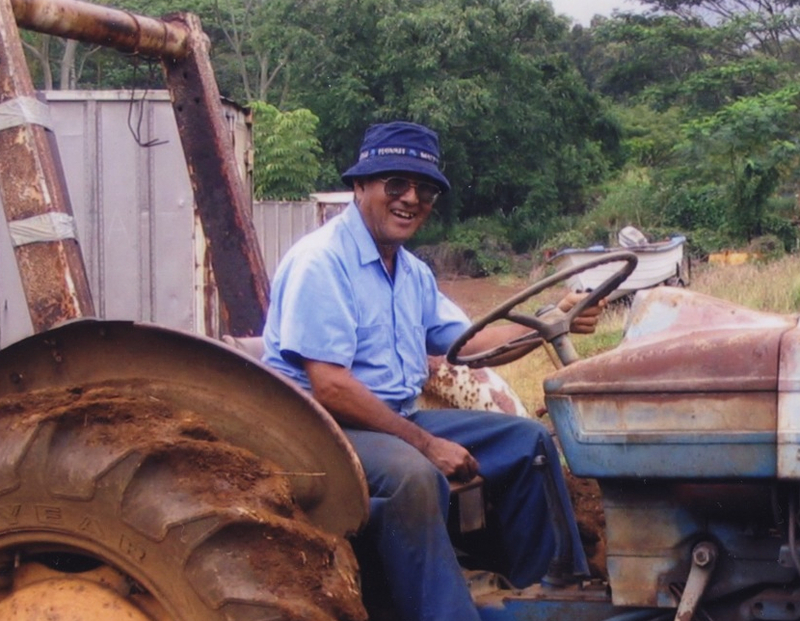 He may have officially retired from his regular job, but he still works more than 40 hours a week doing what he loves the most: farming and agriculture. His family always comes first but those are his other true passions in life. 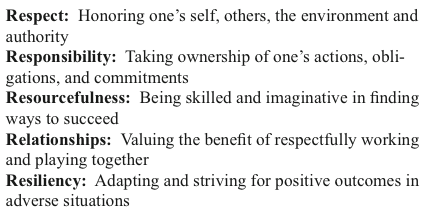 His own early lessons in life helped to build his values to what they are. My dad grew up very poor. His dad was a dairyman and farmer himself. He spent his childhood playing around in the dump searching for handy reusable trinkets or other recyclables. His way of recycling would put the modern day green person to shame. They reused everything and saved many things. He has some of the same tools that his father used on the farm that is still usable to this day, some 60 years later. Talk about durable! As a farmer’s kid himself, at a young age, he learned the ropes of how to do everything. He could ride a water buffalo to use it to plow fields, tie knots of every kind, drive any vehicle, and fix it too. He was always tinkering. 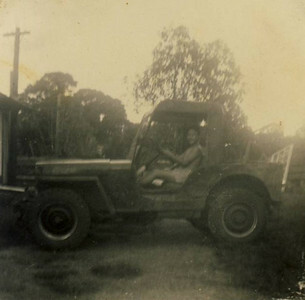 Later when he realized that the military could give him an education and other skills that also shaped his life. Soon he was in Vietnam fixing aircraft in the Air Force also. Those experiences gave him the skills to do practically anything, which he indeed does. My dad is unbelievably skilled at nearly everything which is no understatement. He rigged up his own tractor to become a forklift, welded the picking platform, built bins, built the shed and processing portions, plows, drives a backhoe to dig up stuff or uses a bulldozer to grade the land, can diagnose plant pests and diseases, knows how much and when to fertilize the fields, lays out drip lines and irrigation systems, knows which cover crops to grow and when to plow them in, delivers and packs the fruits and can instantly spot a ripe one from 10 feet below, hauls 50 lb. boxes of fruit several hours a day, knows how to control any weed and what to treat it with, knows almost every kind of plant there is to know and how to grow it, can reuse old fence posts to build a new fence, fix big rigs and trailers as well as park those things, can maneuver in the tightest of spots in Chinatown when delivering the fruits, and so many more skills that I could not list. Farmers like my dad and others across the world are truly amazing people. Until you know one personally and see exactly what they do and how they do it year after year, you can appreciate the depth and dedication that these people live and breathe each day. Farmers were considered one of the noblest of professions which should still indeed ring true today. 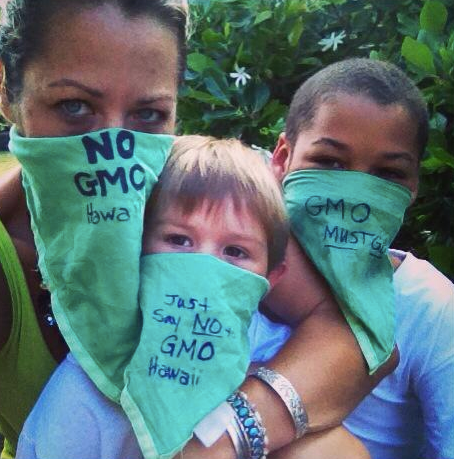 There are a certain bunch of anti-GMO club members that have taken to bombarding the social media. If there is anything with those 3 letters on them, you can bet you’ll find them there. There was a post yesterday in Pacific Business News having an editorial board meeting about the issues at hand in our state regarding biotechnology. 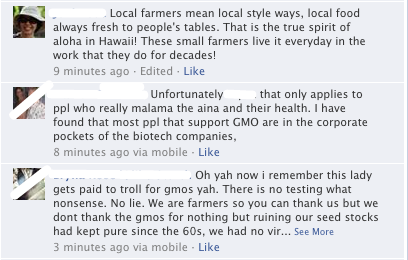 Of course, when you put a comment after all the anti-GMO activists, you will get these kind of comments. Note that I simply asked a question in response to the post. What I got was not a surprise considering that these activists have taken to bombarding the social media. 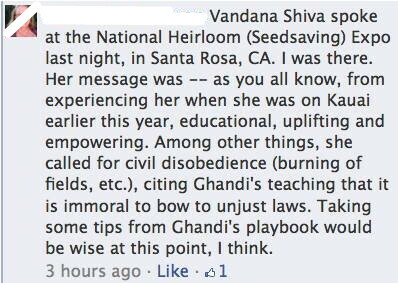 This person has even accused me of antagonizing her too! I can’t quite figure out how but once again paranoia sets in. Another thread starts up too on this same link. I do remember how she and yet another so called farmer posted some very “nice” comments on a farm fair picture on another ag FB page. 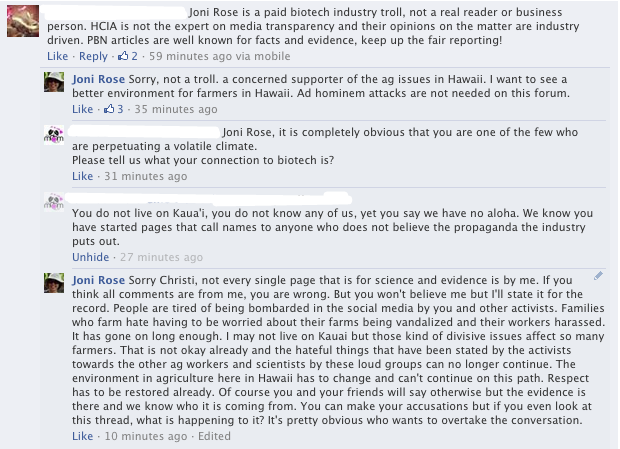 Here’s the no aloha comments posted by these same people in response to mine. Unreal what these people are capable of saying publicly. Of course I was forwarded this clip too of how I acquired my nickname. There is no getting through to these activists. When they have to start attacking people personally, it really shows that there is nothing in the form of evidence to support their argument. They can only resort to name calling or accusations of being a shill. This clearly demonstrates that these people are unreasonable and will only be agreeable to one single demand, their way. Working with the unreasonable will get you no where. That’s fine with me but more reason why we can’t make laws and policy according to these activists demands. Why Speak out for Science? 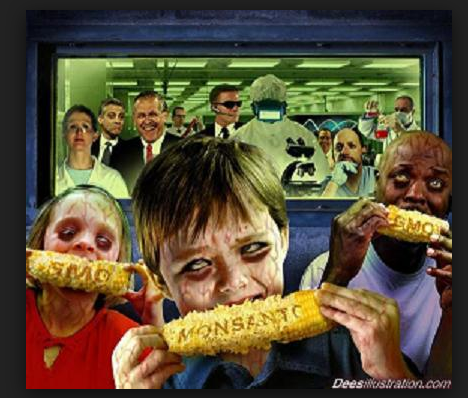 I have to really thank my anti-GMO friends for all of the memes they posted that woke me up to the whole issue surrounding biotechnology. If it weren’t for them, I wouldn’t be here writing this post. It is very unlike local style, or at least the way I was raised to bring attention to oneself. Doing that was considered kind of a no-no. However, after attending school in the mainland and living there for many years, you start to learn that if you don’t speak up, you lose. I learned pretty quick that I’d get run over if I didn’t say anything. So, thanks to that experience, I found my voice. 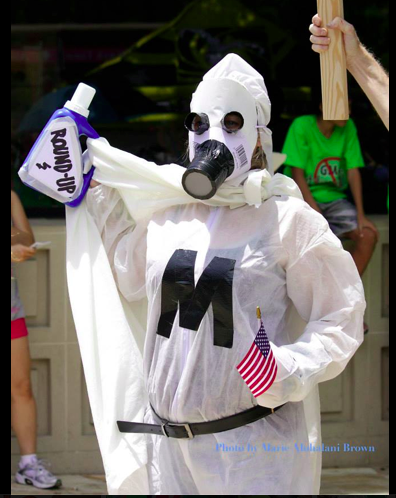 Why speak up for science? Well, when you have the opportunity to see what science and research can do to help people in action, one can see the potential for it in making people’s lives better. I always was told that whatever I choose to do in life, make for certain that you make others’ lives better. That is my mission learned through my experiences. I was lucky enough to go to school at Washington University in St. Louis for my schooling. WUSTL is well known for its medical research and as part of my training, I had the opportunity to observe some of it. I was assigned to observe patients in the Movement Disorder Clinic there. The project at the time was doing test trials of botox on people with movement disorders. Botox was not even on the market at the time but was being studied to see if it could help people with disabling and disfiguring movement disorders. I saw many people that had a wide variety of disabilities resulting from abnormal muscle tone. One woman had a blepharospasm where she had her eyes permanently shut for years. Another was a man who held his neck to the left and could not drive or eat normally or care for himself with his head turned permanently. There were teenagers with cerebral palsy who could not walk normally because of calf spasm. Though all very different, these people could not function normally. The hope was that botox could alleviate these disorders and restore function. The doctor carefully examined each person and injected the muscles one by one with a lot of care. The following week, these people would return and the results were amazing. To see people open their eyes or keep their head in midline and walk normally was something they had never done for years that we take for granted. The research gave these folks improved function and some sense of normalcy that we forget about. These people cried in joy when they had their function restored. I too shed tears witnessing these small miracles. These experiences are events I will never forget. Not many people will get to witness the beauty of science and how it truly affects people’s lives like I did. Nor do people have the same educational opportunities. It is very easy to fall into the trap of fearing what you don’t know. But as someone who has learned and know the benefits of science, I feel a sense of responsibility to educate people and open minds and eyes. Our future can only get better with more knowledge and research. That is why I speak out for science! 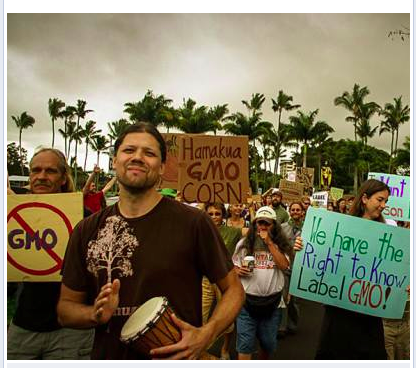 The Legend of the A’ole GMO. Today, I am inspired to actually sit down and write this blog. Why? 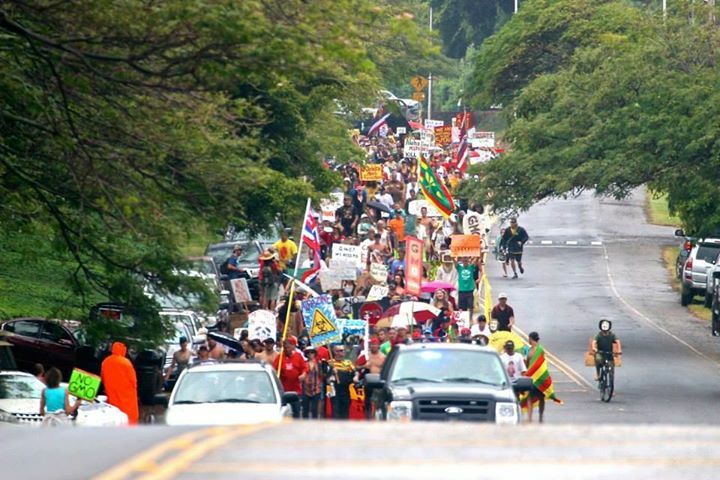 Because the Hawaii that I was born and raised in is changing. Some for the good and some for the bad. Changes are occurring rapidly with how we live and do things in our islands. Local people have to wake up and be part of what’s happening, which is the reason for why this blog is born. I grew up in a time where life was pretty simple. Our family lived on the North Shore behind the Mormon Temple. We were raised in the country where there were no paved roads and mud puddles were our pools. The grassy fields and prawn farms were our playground to wander in all day long without a care in the world. Scoop net fishing, catching catfish, digging up worms, rafting down a stream on an inner tube, and playing mud were some of the activities we did when were done practicing piano or homework. I really had the best childhood a kid could ever have. Here’s a great pic that brings back many of my childhood memories of growing up on the farm. 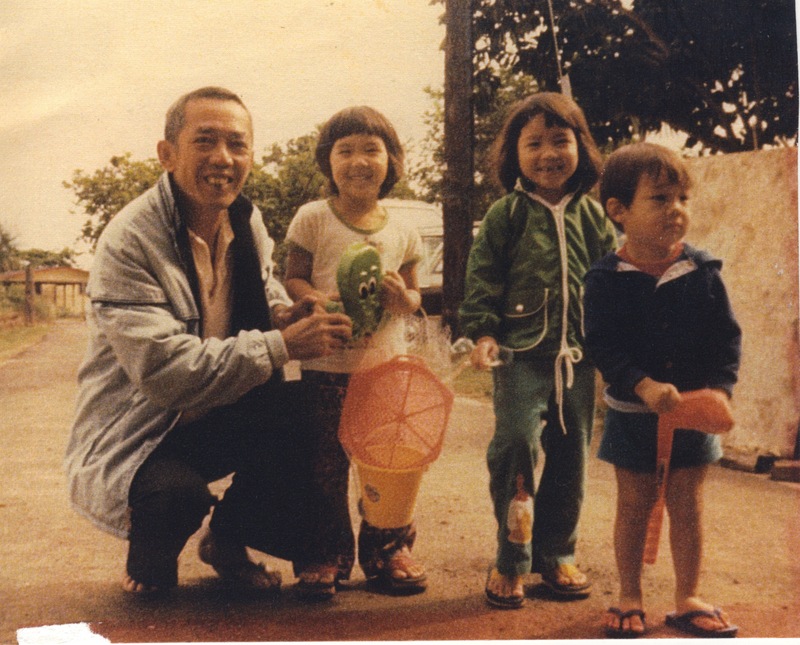 My grandpa would walk us down to the convenience store and buy us candy, then we’d cross the street and play at the beach. Finally, it would be back to the farm for more adventures. As my siblings and I got older, little did we know that we’d become the laborers. The farm life was not an easy one but it really taught me a lot of life lessons that are still instilled in me to this day. My dad would always be on us to always do our best, quality job number one. Never sit to work because that is being lazy. Keep yourself busy, always. Take initiative to do something or find something to do. These were the life lessons learned on the farm that were pounded into our heads. Don’t do things to make the family shame, make us proud of you in everything that you do. Growing up, we’d get sick of hearing it every time it was farm day. Now that I have my own kids, I’ve learned to realize how so many valuable life lessons were acquired on the farm. It’s those things that you can never learn anywhere else. My adventures and insights here are reflective of the lessons learned on the farm that are important lessons for all to learn about.